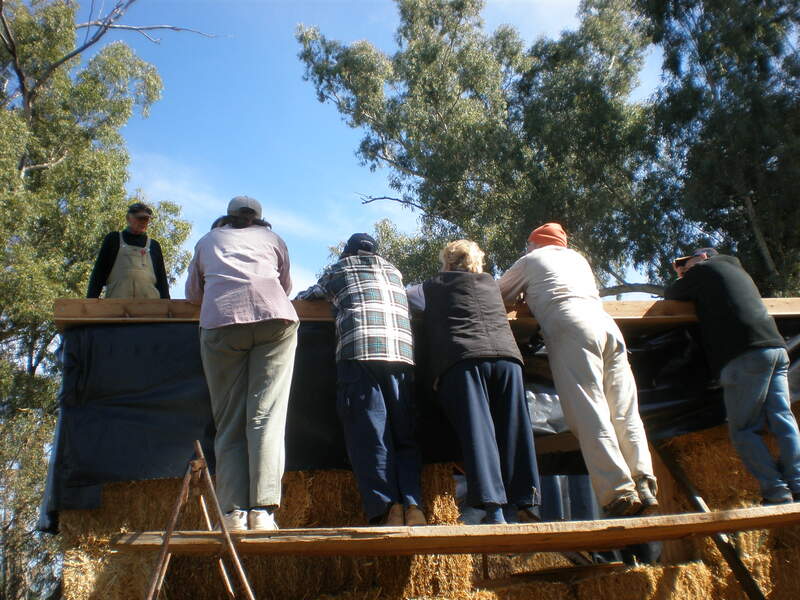 Over the Easter weekend, they traveled to Ganmain in rural New South Wales to participate in a straw bale building workshop, run by Huff ‘n’ Puff constructions (husband and wife team John and Susan Glasford). Unfortunately, this course was somewhat of a disappointment, as M & T had to leave about halfway through the course. Throughout the workshop there were a range of problems with basic co-ordination of catering and meals, but the larger issue was the apparent lack of structure between the theory and the practical components of the workshop. The couple also failed to present professionally, as it was made very obvious to all participants that there were ‘issues’. You can’t blame them too much for this though – even the best of us would be challenged if you had to work with your partner every day for more than 20 years. Well – this experience needs to be put in ‘lessons learnt’ as Tracey was warned about Huff ‘n’ Puff by a work colleague well before the workshop that they were quote ‘dodgy’ – but went anyway. There is no doubt that they have an immense amount of experience and knowledge in this field, but obviously need to think more seriously about the training approach and managing workshops numbers. Throughout the course there was a lot of reference to research that had been done at UNSW but this is not readily available online, which is disappointing. We are still keen to complete the workshop, but after sending a number of emails with no reply, M & T are now thinking of starting again by going a workshop in Mudgee run by Strawtec It should also be noted that the lack of follow up has undoubtedly increased the sense of disappointment in this company. Oh – one last gripe – the accommodation that was touted as a two bedroom flat, was a town hall with a sleep out and mice, including some very stinky dead ones. More on sustainable futures later!